In the heart of Cuyahoga County, a working living floodplain is emerging from a once-lifeless 10-acre plot. As one of West Creek Conservancy’s signature projects, the West Creek Confluence, where West Creek flows into the Cuyahoga River, is envisioned to become the gateway between the West Creek Greenway Trail and Ohio & Erie Canal Reservation. The site will link West Creek Reservation and nearby neighborhoods to the Towpath Trail, Cuyahoga Valley National Park and the Cuyahoga Valley Scenic Railroad. Extending north from Granger Road east of Valley Belt Road in the City of Independence, the 10-acre site straddles West Creek near its confluence with the Cuyahoga River. In addition to providing wetland, wildlife habitat, and flood mitigation, the restored property will offer public access and recreational opportunities. Like many other parts of the Cuyahoga River valley, this former commercial property has been prone to severe flooding. In partnership with the Northeast Ohio Regional Sewer District and the City of Independence, West Creek Conservancy acquired it in 2007. At that time the property contained an abandoned 5-acre warehouse, a drive-through bank, and 4 acres of pavement. 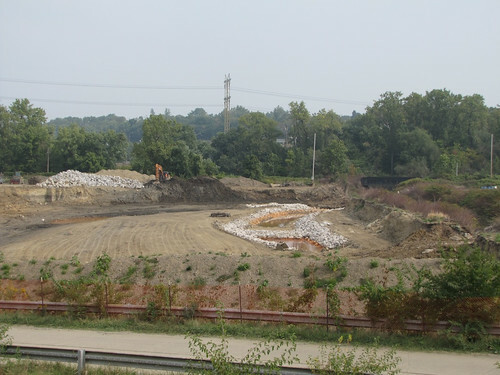 Funding for its purchase was generously provided by the Clean Ohio Greenspace Fund, Scenic Byway Program, the Ohio EPA’s Water Resource Restoration Sponsorship Program (WRRSP), and the City of Independence. Following acquisition, the warehouse, parking lot, and other buildings were removed – the first step in converting an essentially impervious site to one ready for restoration. From 2008 to 2011, WCC leveraged an additional $2.4 million for the site’s restoration. This funding was generously provided by the Ohio EPA’s WRRSP and the Ohio EPA’s 319 Program, as well as the Ohio Department of Natural Resource – Coastal Management Program. Design and engineering work took place in 2012 and 2013, with the first earthwork commencing in April 2013. In addition to removing the pavement and structures, the hardened channel built decades ago to confine the creek has been removed. Land forming has now been completed. 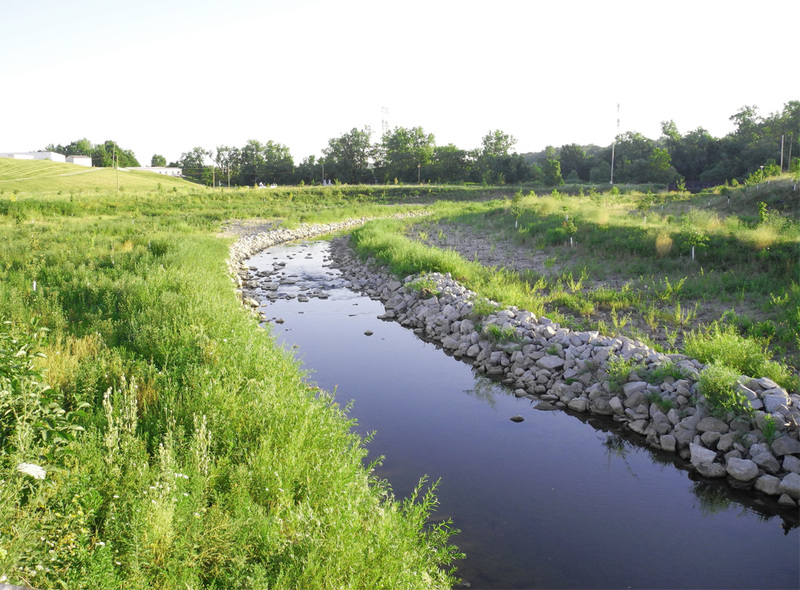 Over 80,000 cubic yards of fill were removed to restore a natural meander to over 1000 feet of West Creek and form over 6 acres of wetland and functioning floodplain. By November of 2013 the first phase of planting was completed, and subsequent plantings were held in the Spring and Fall of 2014, bringing the total amount of plants and trees installed to over 14,000. Lastly, West Creek Conservancy is also diligently working to control invasive species on the site. Click here to view the West Creek Confluence Brochure. To learn more about this unique project, contact Derek at dschafer@westcreek.org. View the West Creek Confluence project photographs below.